Launched in February 2018, the three year project concentrates on amnesia and politics of silence and oblivion that have shaped the constitution of nation-states, identities and communities in Europe and the globalized world. We address colonialism (Belgium), anti-Semitism (Austria), and turbo-nationalism (“Serb Republic”), all of which are central but not the sole factors for the construction of the past and the present in these territories. – a documentation of the symposium “Genealogy of Amnesia – Crushing Silences, Constructing Histories” in Vienna (November 8-10, 2018). 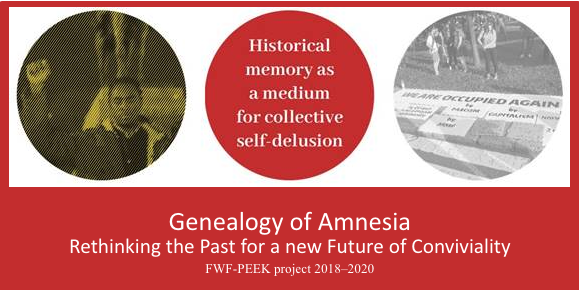 The aim of “Genealogy of Amnesia: Rethinking the Past for a New Future of Conviviality” is to understand how processes of empowerment are built against the politics of collective forgetting and silence. The research is focussed on political, social, ideological, and cultural mechanisms that produce collective amnesia — such as antisemitism, racialization, political and economic dispossession, gender discrimination, or hegemonic nationalism. In order to establish different narrative methodologies and to build a link with the present, an important element of our research project is the development of an alternative archive. The archive “Countering the Genealogy of Amnesia” will be continually updated on our website as our research unfolds. The archive is a collection of digital and digitized materials that address the subjects and objects, the territories and events of oblivion and amnesia. The collection consists of different topics in order to make the documentation of events and interviews accessible. The materials are either original works of artists and researchers or materials collected and edited during the project’s research phase. It is possible to search the archive in regard to territories, topics and names (see drop-down menu).